Jeff Fleming is the director of the Des Moines Art Center. He’s been in Des Moines now for 20 years, a period that coincides with a golden age for the arts and for food in central Iowa. 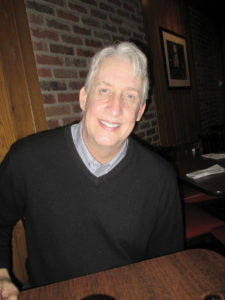 We asked him to lunch to talk about that, and he chose Jesse’s Embers, a cozy steakhouse on Ingersoll. Since I recently commented on the feminine dominance of Vino 213 wine bar, I couldn’t resist counting heads at Jesse’s. Men outnumbered women 28-4 at the time. That does not seem odd at lunch because Jesse’s is filled with masculine trappings — wood, smoke, the aroma of seared meats, etc. Because he grew up in eastern North Carolina, we asked Fleming what he liked about central Iowa barbecue. “I like Woody’s on Cottage Grove,” he said adding that he misses the traditional whole hog smoking of eastern Carolina. Fleming’s hometown was Ahoskie until he went to East Carolina University for a degree in studio arts. He then moved to New York City for a master’s degree in painting and drawing from Pratt Institute. While studying at Pratt, he worked for the Metropolitan Opera in development. “There was a stage door leading back stage. I remember sneaking back there to watch Baryshnikov rehearse. One Sunday I was alone in the director’s office. I answered a phone call, and it was Luciano Pavarotti. I cut him off out of ignorance as to how to transfer a call,” he recalled, laughing. What changes has Fleming noticed about Des Moines in his 20 years here. “When I first moved here, I told someone in my office that I had just moved. His response was ‘I’m sorry.’ I have never heard that since then. Des Moines people have developed a lot more pride in the place. That’s the biggest change — our self-opinion,” he said. “I remember a French speaker in my office talking about Ilium style architecture in Paris. He didn’t believe we had anything like that in Des Moines,” he recalled. Fleming also said that a lot of downtown Des Moines reminds him of Berlin. “Five- to seven-story buildings with multiple uses of materials and multiple textures. There’s of lot of that in both cities,” he said. Fleming also thinks that Mainframe Studios has been a major change. What are Fleming’s favorite Art Center shows? “The most popular shows were ‘Jackson Pollock,’ ‘Drawing in Space,’ and ‘After Many Springs.’ They drew good crowds. For me, it’s always the last show. ‘Sterling Ruby’ now. I see lots of art, yet I rarely feel transformed by the work. I first inundated my self with Ruby’s sculptures at the Whitney Biennial in 2014. Three of his vessels did that to me there. I went to his gallery, Gagosian, to search him out. They put me in touch, and we had a 30-minute conversation. He asked as many questions as I did. I went to his studio, and over a two-year span of time, we agreed on a project. He jumped at the chance to show in the I.M. Pei building here. Then it became a huge collaboration to write a catalogue, set up programs, etc.,” he recalled. We asked Fleming about the Pappajohn Sculpture Park, for which he and the museum acted as an intermediary between to Pappajohn family and the city. “It was amazing. John (Pappajohn) called me in 2007 with the proposal to give his collection to the Des Moines Art Center and place it in the Western Gateway. The Western Gateway had just opened the year before. Huge plans had been put in place for that vision. Yet, in just two years, people had the vision to change all the planning to accommodate this. “Des Moines is good at this kind of thing. Gray’s Lake is another example of flexible, visionary thinking. The Renzo Piano building (Kum & Go headquarters) has transformed every property in its neighborhood. The assessed value on the area in 2009 was $45 million. Now it’s 10 times that. This kind of thing changes the cultural landscape, too. This kind of change worked here because of scale, beginning with Crusoe Umbrella. Public art statues used to be fairly invisible. Now, public art by living artists is altering relationships between time and place. “Not that long ago, the public here was quite critical of things like the Robert Serra stones in the Art Center lawn, the Pei building, the Richard Meire building, the Jeff Koons washer and dryer. In Paris people did not like Pei’s Glass Pyramid at the Louvre, nor the Pompidou Center when they were new. Now both those things are icons. Ironically, we recently loaned the Koons piece to the Pompidou Center for a show there,” he said. Acquisitions are often how a museum director is appreciated and remembered. Does Fleming have any purchases in his tenure here he is particularly proud of? “Just as my last show is my favorite show, so is my most recent purchase. Now that is a Bill Traylor. Traylor was born a slave on the Traylor Plantation near Montgomery. In his late eighties, he began drawing and painting to tell stories about the history he witnessed. (When he died at 96, he left behind more than 1,000 paintings.) He is the first artist born into slavery to be given a solo show at the Smithsonian. “I first ran into his work at the show in the Corcoran (Washington D.C.) in 1982. Traylor was the star of that ‘Black Folk Art in America’ exhibition,” he recalled. What does Fleming want his role to be in Des Moines going forward?